Anna Sledge holds a side plank during a group exercise class led by Carolee Poythress. Nearly a decade ago, Pantea Dougani just wanted a workout program where she felt comfortable and connected. She bounced from gym to gym, but none felt right. Frustrated, she called fitness trainer Carolee Poythress, whose style and methods Dougani liked but who wasn’t with a gym at the time. “Just train me in your garage,” Dougani recalled saying. 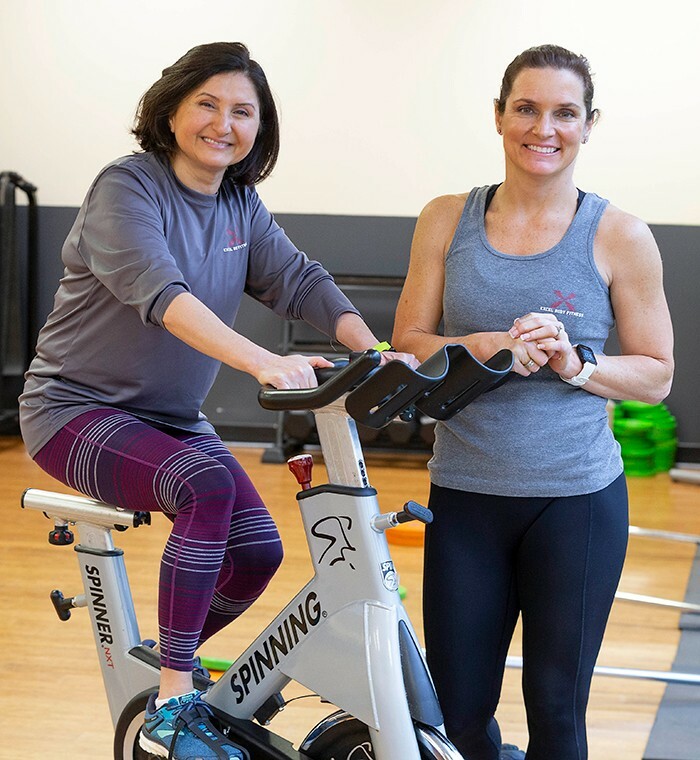 Owners Pantea Dougani, left, and Carolee Poythress opened Excel Body Fitness in Cary in 2010. Since then, the gym has expanded its services to include corporate wellness programs, massage and nutritional advice. Instead, Poythress, who was getting ready to launch her targeted exercise program at Crosspointe Church in Cary, asked Dougani to be her partner. The two women spread the word, and nearly a hundred people showed up for that first class. They knew they were on to something. In 2010 Dougani and Poythress launched Excel Body Fitness. 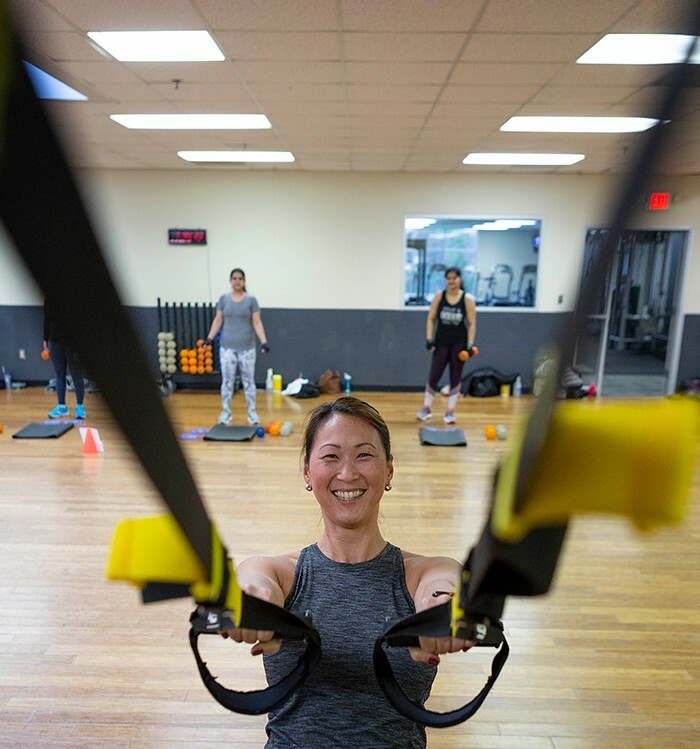 The Cary gym now offers personal training in a group setting, a diverse menu of fitness classes, nutritional and fitness assessments, massage and a variety of other services. 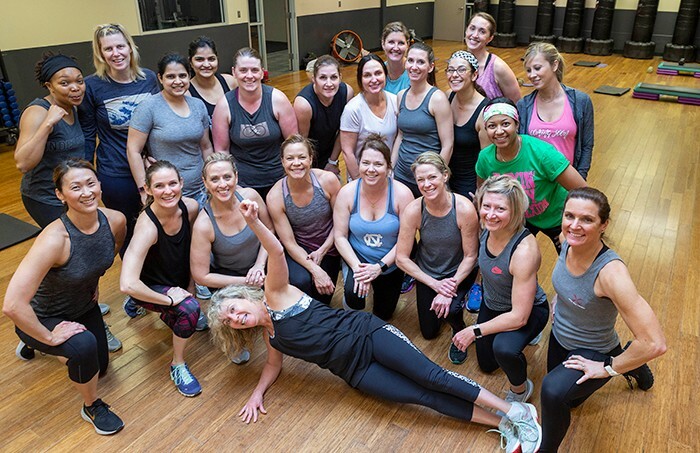 The staff’s commitment to customers earned the club an honorable mention for Best Fitness Club in the 2019 Maggy Awards. “Wellness comes in a lot of shapes and sizes. It’s not just jumping around,” said Dougani, now the managing director in charge of growth and strategic development. She recently talked about the business and the benefits of a lifelong commitment to health. We are a small, woman-owned business with the wellness of our community in mind. We specialize in functional training which will result in overall wellness today, but more importantly, it will help members to stay fit in their later years. Aging gracefully, living life, and staying strong and fit is what our business is all about. Janessa Core leans back during an exercise using the TRX Suspension equipment. The nylon bands help build core strength and balance. Carolee has 28 years of experience in fitness, teaches more than 24 classes a week, and is truly gifted in what she does. As her business partner, I have taken her classes every day for the past 12 years — even before we started Excel Body Fitness. She has made a huge difference in my life, and she continues to do the same for many of the members we have had over the years. Our classes are not easy by any stretch of the imagination. We provide personal training in a group setting, emphasizing balance and muscle strength, which makes us different from our competitors. There is nothing wrong with looking good, but usually that is a byproduct of your wellness routine and should not be the goal. We also believe that diet and massage must be part of a wellness routine. We have a dietitian and an exceptional massage therapist on staff who work with our members. How has your vision for the business changed since you opened? About five years ago, we realized that many working people do not have the luxury of taking the time to go to the gym before or after work because of family obligations. We decided to reach out to corporations and bring the training to them. Alessia Marin lifts weights during a class. Excel specializes in personal training in a group setting, so workout regimens are customized for each client. Now we are in several corporations, providing functional training, mindfulness, chair or table massage, reflexology, yoga and nutrition advice. Participants experience greater mental clarity and creativity, stress reduction and overall wellness. We are fortunate that the corporations we work with understand the value of our programs. They also recognize that physical and mental wellness are connected. What’s been the best, or most surprising, aspect of owning a business? Carolee Poythress, right, poses with her Wednesday morning boot camp class at Excel Body Fitness. We have been fortunate to have so many wonderful members, some of them are working for us as childcare providers, instructors and frontdesk staff. Excel Body Fitness is not only our members’ happy place, but it is our happy place, too! What’s been the biggest challenge as entrepreneurs? As a small, independently owned local business, we never had the backing or advertising power that franchises have. However, we had the freedom to design our business in a way that we truly believed in. To have a family-oriented friendly place that everyone is welcomed to join and able to workout, regardless of the shape they are in. To bring wellness to the community at their place of work — without judgement. 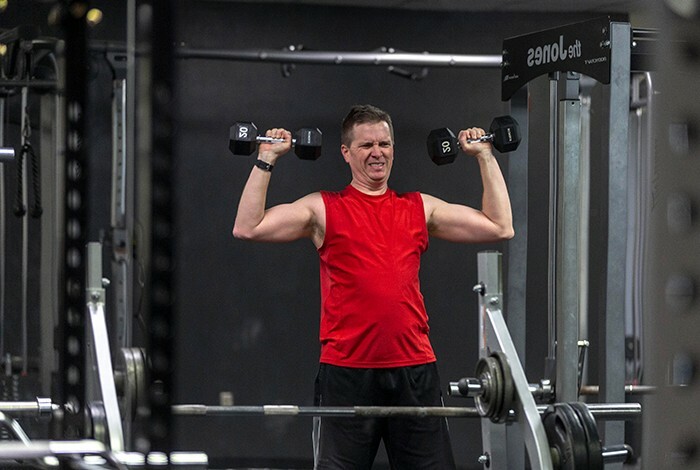 Ross Warren lifts weights at Excel, which offers a tiered membership program. 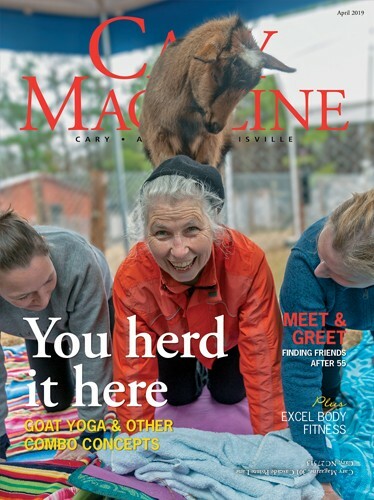 The basic level includes access to the weight and cardio room, the middle level adds some classes and the top level includes access to Poythress’ signature exercise training classes. Another challenge that we have had is to secure a large enough space to conduct classes, have an open gym, enough space for personal training, massage and nutrition all in a correctly zoned building. We had a lot of help from the community to get started and get to where we are. If you had to pick one thing, what would be most important for lifelong fitness? The most important thing is to realize that fitness is not a luxury; it’s a necessity. It is just like brushing your teeth every day.